In South Haven, Michigan, (picture left) a rain garden that looks like a city park with perennials and grasses forms the corner of a downtown parking lot. The idea behind rain gardens is to prevent storm water from rain to flow into sewers and filters – and hence waterways like rivers and lakes - but into the ground instead. The gardens are shallow depressions which allow water to flow into them as opposed to adjacent sewers. When rain goes down sewers it picks up man made contaminants such as tar on the streets or any other substance on grass or pavement – fertilizers, pesticides, oil. Gardens also allow for the “uptake” of water and nutrients by local plants, enhancing the garden effect. ERCA worked with the town of Leamington and the town’s horticultural society to plant native species, helping create the ground filter. Besides offering an obvious environmental or practical benefit the gardens are obviously lovely to look at. “In developing a rain garden, you are not only beautifying your neighbourhood, but providing a home for wildlife while utilizing storm water runoff,” explained horticultural society president Ken Clark in a release. Town councillor Rick Atkin said the gardens will be helpful in lessening fertilizer – such as phosphorous - runoff, which have been implicated in the large algae blooms recently on Lake Erie. 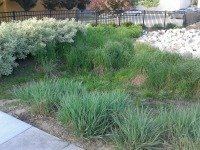 ERCA has an online guide on how to make your own rain garden.